Media captionLook who managed to "Slytherin" to the record books! 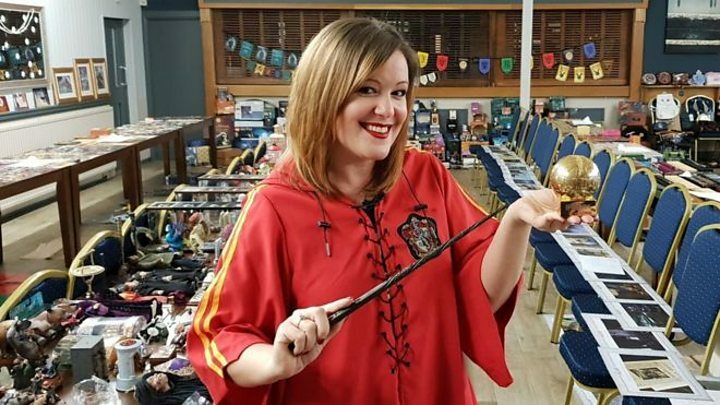 A Harry Potter superfan has managed to "Slytherin" to the record books after collecting thousands of pieces of memorabilia. This earned her the Wizarding World Collection world record - which includes the Fantastic Beasts series. YouTuber Mrs Maclean, 38, said: "I screamed a lot - it was so incredible after all these months." Ever seen a seven-year-old this fast? This new record, incorporating collectibles from the wider JK Rowling universe, means Mexico City's Menahem Asher Silva Vargas, who has a 3,097-strong Harry Potter collection, keeps his world record. Mrs Maclean said: "Guinness said, 'If you want, you could go for the Harry Potter record', but my husband would divorce me if I did!" It was while she was pregnant in 2001 that Mrs Maclean's magical love affair began. She was watching a segment on Blue Peter about Harry Potter and - two weeks later - had bought and read the first book. Since then, the mother-of-three has collected every book, DVD, toy, bag, item of clothing and piece of jewellery she can - as well as a host of other collectibles. Image caption "If you see a box, or a trunk, or a drawer, or a cupboard in my house, if you open it, it's just Harry Potter from bottom to top"
Her prized possession is a 24 carat gold-plated Golden Snitch puzzle piece from Japan - one of only 5,000 made - which took six years to track down and buy. Even with this record - there is still the Holy Grail that eludes her - a first edition of Harry Potter and the Philosopher's Stone. "I'll never stop collecting until I really, really have to. I don't smoke, I rarely drink - this is my vice," she added. As part of the record assessment, all items were assessed and verified by two independent witnesses - one of whom had to be a specialist in the area - and only official merchandise counted towards Mrs Maclean's total. Image caption Which house are you: "Ravenclaw with Slytherin traits and Hufflepuff"